Londinium was founded by the Romans nearly 2000 years ago, shortly before AD 50. Roman London was built on a ‘green-field’ site which is now occupied by the City of London and north Southwark. The early frontier town was an immediate success and was occupied for almost four centuries. For much of this time Londinium thrived, despite disasters that included destruction at the hands of Boudicca, widespread fires, economic problems and political crises. Although abandoned in the 5th century, Londinium’s layout determined the siting and shape of the medieval City of London and hence the modern metropolis. Over the centuries London’s ground surface has risen inexorably and as a result Roman streets and buildings lie buried up to 7m below the modern street level. This map, created by Museum of London Archaeology, graphically presents our most up-to-date knowledge of that lost world: the Roman city’s topography, plan and appearance, including its roads, waterfronts, public buildings, houses and defences. Roman remains are accurately located and superimposed on the modern street plan, with visible features indicated. The accompanying guide, on the reverse of the printed map, provides a descriptive history of Londinium and illustrations of important sites and finds, many of which can be seen in the Museum of London galleries. Streetmuseum™ Londinium See Roman London brought to life with Streetmuseum Londinium, presented by the Museum of London and HISTORY™. From the Temple of Mithras to the amphitheatre, this iPhone and iPad app combines our map of Londinium with present-day London to reveal the hidden city beneath your feet. As you’re guided around the capital you’ll unearth exquisite artefacts as if discovering them for the first time; listen to the hustle and bustle of the city; and step back 2000 years as augmented reality video presents scenes of Roman London against today’s modern backdrop. http://www.museumoflondon.org.uk/Resources/app/Streetmuseum-Londinium/in... Download this iapp free of charge from iTunes. MOLA 2011. ISBN 978-1-907586-05-7. Pb Map. Colour. "… this map is a remarkable achievement, drawing together the range of archaeological work of the last three decades into a powerful synthesis. 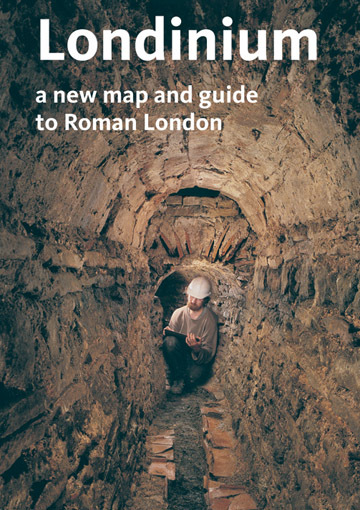 It is a must-buy for anyone interested in Roman London, from the visitor to the scholar." "The excellent, up-to-date, fold out Londinium map has ‘landscape indicators’ making it easy to gain a proper fell for the Roman settlement including north Southwark." "The modern street layout is as a buff background, with the Roman plan boldly superimposed: with Londinium in hand, one can walk through the City and envisage that lost world of Caesars beneath our feet." "It is well worth the effort!"